Walk test with Ryan Lampp for the robot in our film 21 Points. Sound is just a rough scratch layer, but I usually like to add a soundbed, even for tests. This test was executed while working with Ryan at the early stages of pre-production to see how a performance would work when working with an actor standing in for the robot just offscreen. Its a buddy movie so the connection between the robot and his human has got to be really solid. For example If we lose the sense that Ryan has actual eye contact with the robot when he is talking with him then this connection will be broken. We are working extremely hard to make this work in all shots, creating a set of rules for the shoot while still not letting these rules limit us creatively. When we made this test the most important thing we resolved is that the robot would have to be left handed if the the human hits with his right to allow us get the best angles without crossing the camera line. Alembic was a key technology to move the character to C4D from Maya. Surfacing and most UV's were done in 3D coat, rendering was done using Vray and C4D R15 Team Render across a mixed network of macs and PC's. Its not very obvious in this test but you may notice the robot has a leg design that is identical to the hind leg of a quadruped. This is called reverse knee. One thing that was especially difficult to solve was re-targeting the human biped motion capture to the robots reverse knee design. But we did and it works great. The robot is not yet finished - at this point the robot is about 80% complete in terms of its surfaces being painted and grease and dirt being added. Part of the process will be aided by the imminent release of and update to our V-Ray render engine. Studio Local has its own short in production titled ‘21 Points’. 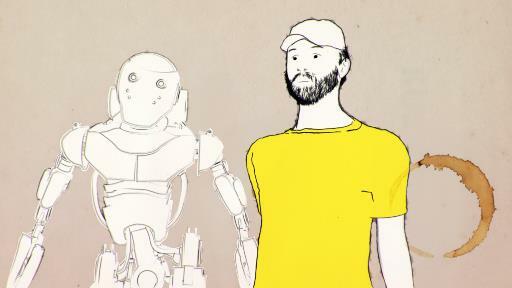 The film explores the relationship of a grown man, his imaginary friend ( who is a robot ) and his mum. As the robot is a product of a human disfunction the robot’s performance must of course appear very human. To make this possible we'll will be using Studio Local’s new motion capture stage through-out. This is where we'll be uploading development images, links to shot tests and development process for the film. We hope you come back and check in frequently. If you want to be notified of any update please follow us on twitter as anything posted here will be pushed there. We are very grateful to have been supported by the New Zealand Film Commission by stumping up some cash to help us shoot it. Robin Scholes and Andrew Adamson will be guiding us in our choices as executive producers and we are extremely lucky to be able to say that. 21 Points | Crew | Director of Photography.